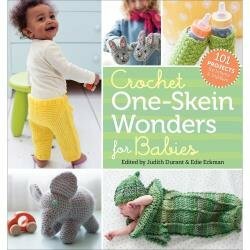 This collection of 101 projects makes it easy and fun to crochet adorable clothes, toys, and accessories for the babies and toddlers you love. Each project uses just one skein of yarn, many take just a few hours to complete, and plenty are suitable for beginners. Hats and caps, bootees and sock, mitts, dresses, tops and bottoms- plus blankets, bibs, soft toys, bottle cozies, diaper bags and more. Each pattern comes with complete instructions, charts, schematics and beautiful photographs. 288 pages.